Kam grew up absorbing the nectar of this traditional discipline. His philosophy and approach to wellness is based on educating the patients and planting the seed of knowledge to prevent illnesses and diseases. To guide the patients in living a moderate and balance lifestyle combined with healthy nutrition, exercise and living well to eradicate pain, reduce stress and to have a better life free of unwarranted medical side-effects, a total well-being. Kam attained his first Acupuncture diploma in Singapore under Professor Zeng Guoyang (Advanced Acupuncture Center, Republic of Singapore) in 1990. In the States he completed his Florida State Approved Acupuncture Physician Program in Five Elements Acupuncture and after passing his Florida State Board exam, obtained his Acupuncture Physician license in 1994. 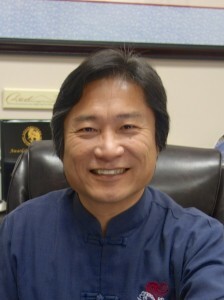 He has since practiced in Orange Park and Jacksonville and is currently the Principal Acupuncture Physician of Kam Lee Acupuncture Center in Fleming Island, Florida. Apart from his training of Traditional and Classical Acupuncture, Kam was certified as an Advanced NAET (Numbudripad Allergy Elimination Technique) practitioner in 2003. Most importantly his continued training in Tung’s Acupuncture with Dr. Palden Carson M.D. WTAA, a disciple of the renowned Chinese Acupuncturist, Master Tung (1915 – 1975) has advanced his efficacy on the techniques of Acupuncture. The late Master Tung was famous for his outstanding and often quick results obtained by using only very few Acupuncture needles. Kam completed his Advanced Tungs Orthodox Acupuncture in 2006 under Dr. Carson and has implemented this method of treatment exclusively in his practice with great results. Dr. Carson who is also trained in Sports Medicine and surgery in Taiwan, is from Tibet and currently practices Acupuncture in Toronto, Canada. Apart from being a healer, Shifu Kam Lee is also a well known martial arts practitioner in the United States who frequently officiates in national and international tournaments. He is a 4th generation Tiong Wah Wuzuquan practitioner under the late Grandmaster Gan Hu Chang of Singapore and a 20th generation Chen Family Taijiquan practitioner under Grandmaster Zhu Tiancai, one of the famous “Four Arhats” (四 大 金 刚）of Chen Family Taijiquan. To learn more about health and self-defense classes, please see our Kung Fu Academy.